Baby luxuries. Bassinets and toile Moses baskets. The Levtex Baby Willow Nursery Collection features a beautiful ruched quilt, a 100% cotton crib fitted sheet, a three-tiered dust skirt, a diaper stacker and metallic silver wall decals with the phrase "I love you to the moon and back" featuring a crescent moon and star. Old-fashioned glamour makes an appearance here on this six-light wrought iron chandelier with silvery finish and a display of clear crystals to enrich the visual palette of your setting Carved by hand from tropical hardwood, this stunning dresser adds unparalleled charm to any space - and its generously sized drawers help you organize all of your essentials. This chair has it all—the freedom of swivel mobility, comfortable seating, and modern good looks. Decorative nailheads outlining the frame add a distinctive touch. Handcrafted four-drawer chest. 56"W x 19"D x 41.5"T. Maple veneers; bisque finish; antiqued-mirror drawer fronts with decorative carving and border overlay. Bun feet; center support leg; adjustable drawer glides. Mortise-and-tenon construction. Anti-tip kit included. White/silver Metal sconce with grosgrain bow detail. Mirrored wall plate. Designed by kate spade new york. 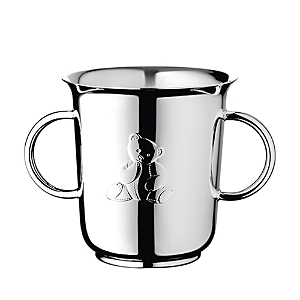 Decorated with a sweet teddy bear silhouette, Christofle's Charlie Bear Cup makes a treasured keepsake for the new baby Give your baby's bedroom a luxe look and feel with the fresh white tone and embroidered eyelet border of this soft Lily Velboa blanket from Carter's Handcrafted wrought iron chandelier. Create a relaxing space for your child to drift off to sleep with the carefree prints and calming tones of this Happy Little Clouds crib bedding set from Little Love by NoJo This sweetly simple rug is a charming addition to your little one's playroom, bedroom, or nursery. Make naps and playtime a magical experience with the enchanting design of this Liliana Shaped Floor pillow from Urban Dreams. A starlight illumination organically pierced console lamp with a layered stone base. This pierced metal lamp will radiate small beams of light onto its surrounding. Create a relaxing space for your child to drift off to sleep with the carefree prints and embroidered appliqué of this super-soft Happy Little Clouds plush blanket from Little Love by NoJo. A charming addition to any little one's room, these star-shaped twinkle lights lend a soft, soothing glow at bedtime. Keep your infant warm and cozy in style with tadpoles ultra-soft chenille knit baby blanket. Made from 100% microfiber polyester, this baby blanket stays buttery soft and gentle for baby's sensitive skin. The soothing texture is the key to calming your fussy little ones when it comes time to nap Printed paper. UK Encourage your child to shoot for the stars with the imagination-stirring rocket-ship design of this cozy Stellar Space hooded throw from Urban Dreams. Featuring a sweet print of ice cream cones and popsicles, this charming swaddle is the perfect gift for summer babies. Tadpoles star appliqué plush fleece baby blanket is a supremely soft, micro plush blanket, perfect for wrapping baby in luxurious comfort. Made of 100% microplush polyester, adds a glamorous accent to baby's crib, stroller or car seat with metallic star applications. Makes a great baby shower gift. Designed by Mandi Smethells in collaboration with Anthropologie, this whimsical play gym features a textured toys for your little one to discover and explore. Keep your infant warm and cozy in style with tadpoles ultra-soft chenille knit baby blanket. Made from 100% microfiber polyester, this baby blanket stays buttery soft and gentle for baby's sensitive skin. The soothing texture is the key to calming your fussy little ones when it comes time to nap Refresh your baby's bedding with the super-soft cotton sateen this fitted crib sheet from Carter's. Tadpoles star appliqué plush fleece baby blanket is a supremely soft, micro plush blanket, perfect for wrapping baby in luxurious comfort. Made of 100% microplush polyester, adds a glamorous accent to baby's crib, stroller or car seat with metallic star applications. Makes a great baby shower gift. Set of two. Wood As a child, Darrah Gooden was drawn to 1960s children's books that were filled with bold cut-paper illustrations, with imperfectly cropped shapes and vivid colors interacting to create magic on every page. She earned her BFA degree with a painting emphasis, and now resides in Dallas, Texas, where she works mainly in collage. 14"Dia. x 17"T with 6'L chain. Pendant light with handmade ceramic flowers and beads. Steel frame has an antiqued gold-leaf finish. Suitable for children from birth to 24 months. Soft, warm, insulating and absorbing. Made of velour terry. Makes drying off fun and efficient. 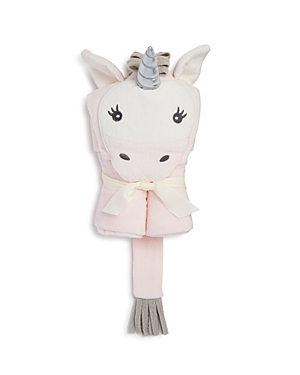 Features sweet unicorn with embroidered eyes, a metallic horn and a fringed tail Includes plush bumper, 27" x 32" receiving blanket, mattress, and all natural basket made of woven palm leaves. Ivory. Arrives beautifully wrapped in tulle with a large satin bow. Gund "Magical Light and Sound Unicorn" soft stuffed animal. Long, feathery rainbow mane and tail. Glittered, iridescent horn and light-up wings. Metallic harness and shooting star embroidery. A perfect blend of retro style with a modern feel this unique swivel chair will highlight any décor. The graceful sloped arms have a slight flair at the end while the frame rests on a distinctive grayish, sandstone finished base, while the faux sheepskin cover creates a dynamic visual effect. Plush Boogie Baby blanket with sleeping teddy bear and star appliqués. If desired, personalize with embroidery (up to 11 letters) in style shown. Ruffled satin border; rounded corners. Chevron-print reverse. 40"L x 34"W. Polyester. Made in USA. 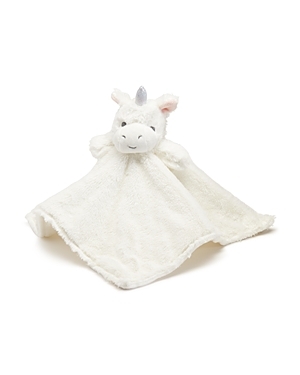 Boogie Baby bath towel with plush polka-dot hood and unicorn appliqués. If desired, personalize with embroidery (up to 11 letters) in style shown. Cotton terry. Combo, polyester. Machine wash. Made in USA. Add fun to your child's bedroom decor with the Plush Unicorn Chair from Cuddle Me, featuring a cute plush character that is soft to the touch. Tadpoles quilted toddler comforter features a super soft, brushed microfiber cover with a lofty 200gsm fiber fill. Sized at 40" x 60", this comforter is the perfect size for both toddler and little kid's beds. Stitching keeps inner fill securely in place, evenly distributing a breathable warmth. Add fun to your child's bedroom decor with the Luxury Plush Security Blanket Ivory Unicorn from Cuddle Me, featuring a cute plush character that is soft to the touch Using soft, playful foam, Tadpoles Unicorn Play mat Set provides a fun, safe environment for your little one. Made of large, interlocking foam pieces with removable shaped centers, the mats create a soft base for your child and add a great look to any room. Includes 16 foam frame pieces, shaped center pieces and 16 border pieces. Make naps and playtime a magical experience with the enchanting unicorn design and cheerful tones of this Liliana backrest pillow from Urban Dreams. Add fun to your child's bedroom decor with the Luxury Plush Ivory Unicorn from Cuddle Me, featuring a cute plush character that is soft to the touch. Make naps and playtime a magical experience with the enchanting wearable unicorn design of this Liliana hooded throw from Urban Dreams. 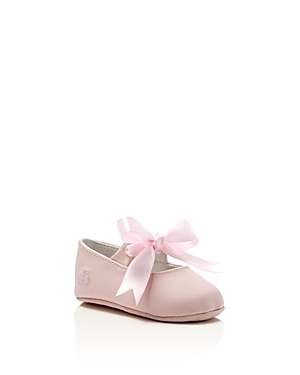 An elegant ballet flat by Ralph Lauren with darling bows at the ankle The Ballerina Bows crib set from Nojo is the perfect addition to the room decor of your young dancer, complete with ballerina shoes, tutus and a range of pinks, grays and whites. Table lamp with metal bow at neck. Designed by kate spade new york. "Jax" recliner chair with a vine silhouette motif. 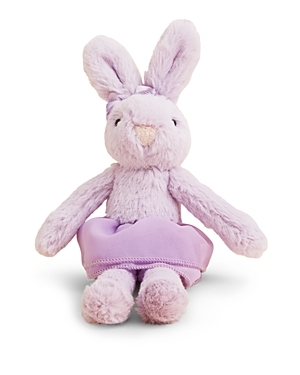 Features rechargeable battery pack for fully powered recline option The perfect reading partner for the Dance Bunny Dance book, Lulu the Tutu Bunny comes with a sweet tutu skirt and bow in her hair. 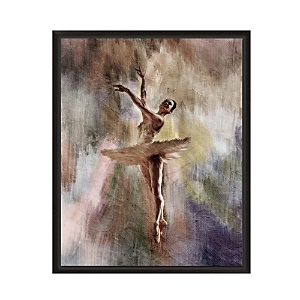 PTM Images wall art featuring a dancing ballerina makes a graceful, inspiring statement. Add French-Luxury to your favorites.